Macy’s offers more than just your favorite designers, a great shoe selection and the best sales. Their registry is full of fantastic perks, great products and exclusive brands like Martha Stewart and The Hotel Collection. 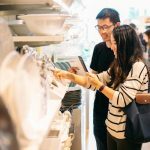 Your registry is the time to think through every possible item you could ever need in your future as a couple. That may seem daunting, but with the Macy’s “Top-of-the-List” picks you’ll be off to a great start. We’ve selected a few beloved pieces from each category to get you started! 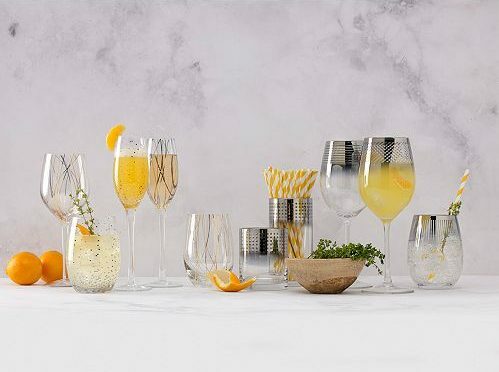 As if you need another excuse to invite your family and friends over to your newlywed abode, these luxurious gifts from Macy’s are the perfect reason to throw your first party! I believe there are few things in the world sparkly polka dots can’t make better. That’s definitely the case with this festive set of Mikasa drinkware. No matter what drink you’re mixing, there’s a glass for you in this fun set. Keep is simple and classy when it comes to silverware. 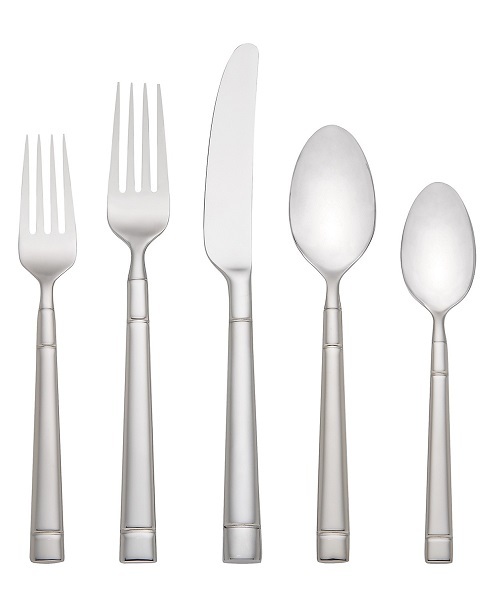 Kate Spades Fair Harbor 45- piece set covers both those bases with clean lines and a gorgeous stainless finish. I’ve been to a lot weddings in the past two years and the Noritake dinnerware set has been an obvious fan favorite on most registries I’ve shopped. Its variety of colors (over 20 to choose from!) will match any new kitchen and its smooth stoneware finish is very durable. If it’s not moving, monogram it. It’s true for your tote bag and with these Lenox plates, it can be true for your new kitchen. 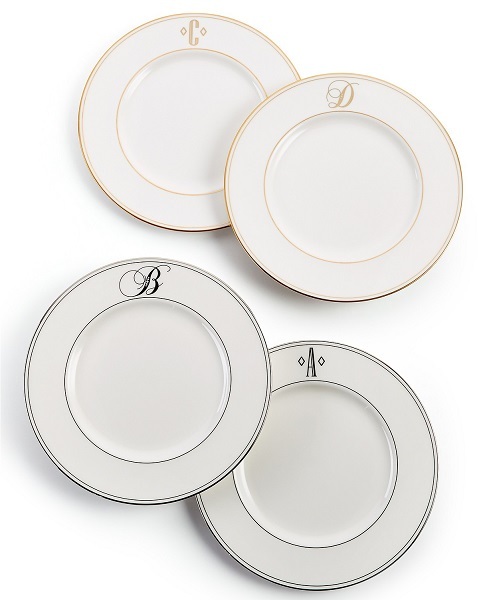 Add a few of these accent plates in your new last initial to your registry and prepare to wow! Get your new kitchen off to a great start with a few of these quality, timeless pieces. As a new bride, you’ll be trying your hand at cooking dinner and baking your new husband’s favorite treats. 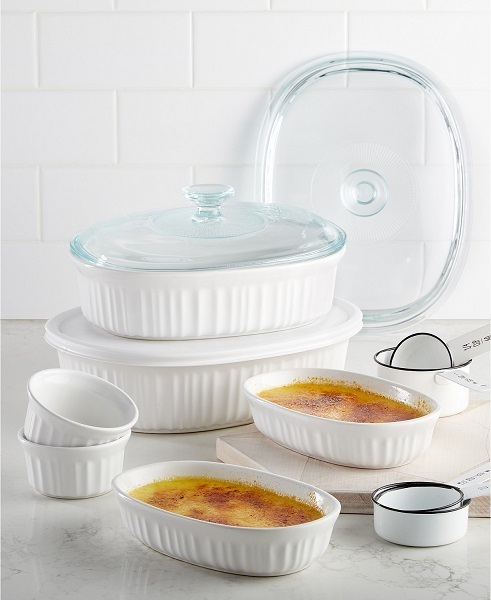 Make it all look even more beautiful in one of these Corningware baking dishes. 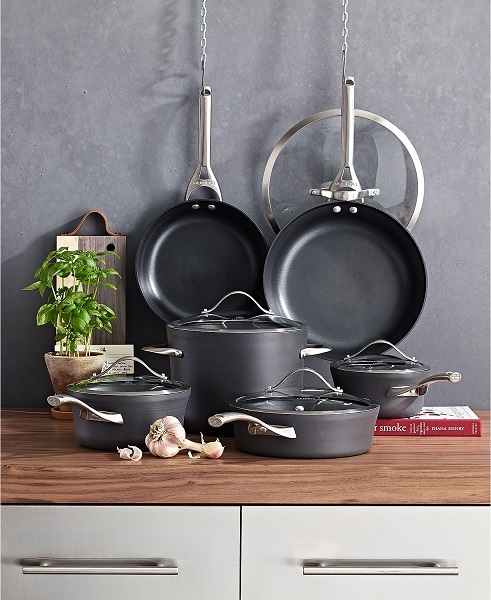 A full set of cookware is of utmost necessity for your registry. This nonstick set by Calphalon turns a necessity into a dream. Easy to cook on, easy to clean and easy to love. 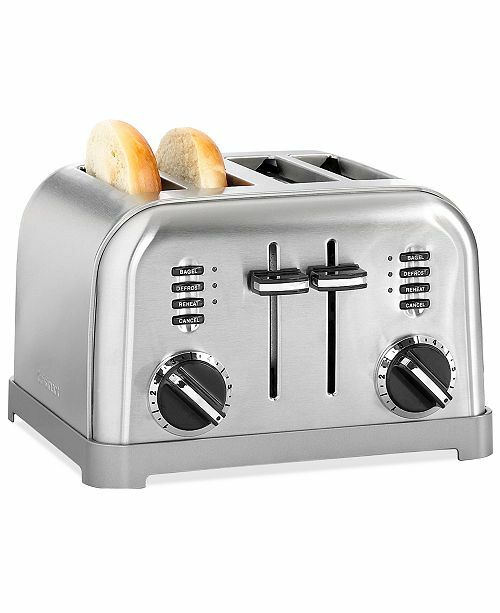 A chrome toaster will coordinate well in any kitchen style. The classic throwback look of this one adds a fun touch to any countertop. Take your coffee game up a notch with this Ninja Coffee Bar. 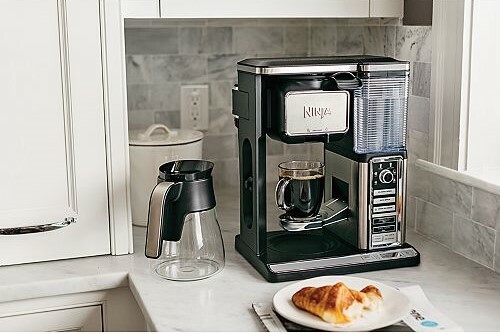 Not only will it brew a pot of your favorite coffee, it can also make the best cafe drinks like lattes and iced coffees. Turn your new home into your favorite retreat with these cozy, comfortable bedroom and bathroom pieces from Macy’s. 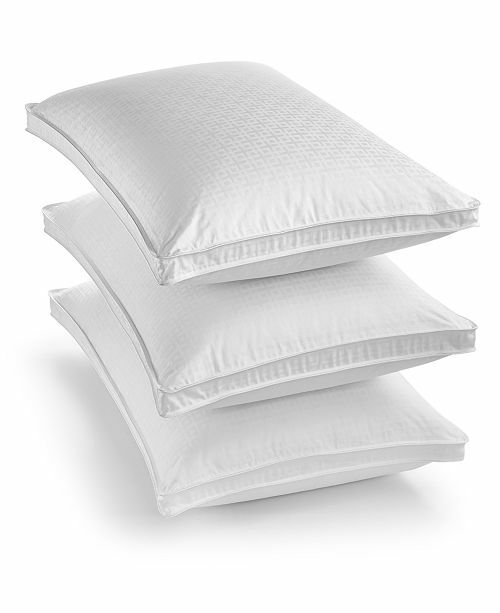 My mom is the best at picking out nice, long lasting pillows and these goose down ones by Hotel Collection would definitely be at the top of her list. Create a soothing, relaxing space with this Martha Stewart bedding set from Macy’s. The cool gray and plethora of fluffy throw pillows will be the perfect spot to land after a long day at work. 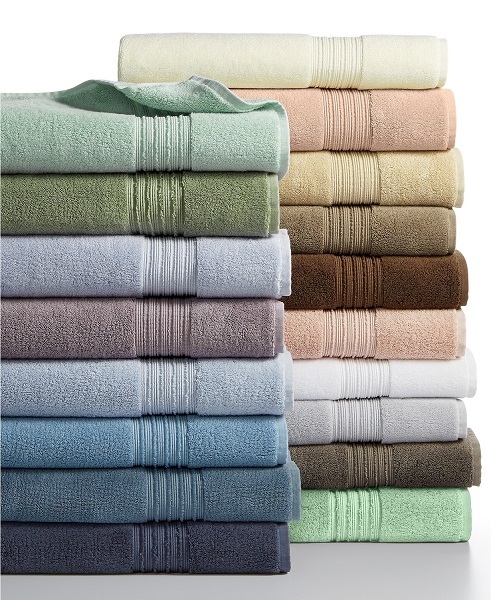 Choosing a color will be the hardest part of picking out these turkish bath towels by Hotel Collection. Their plush, spa-like feel make them an easy choice in every other area. Nothing will make you want to clean and organize your house more than a few new items from your registry. 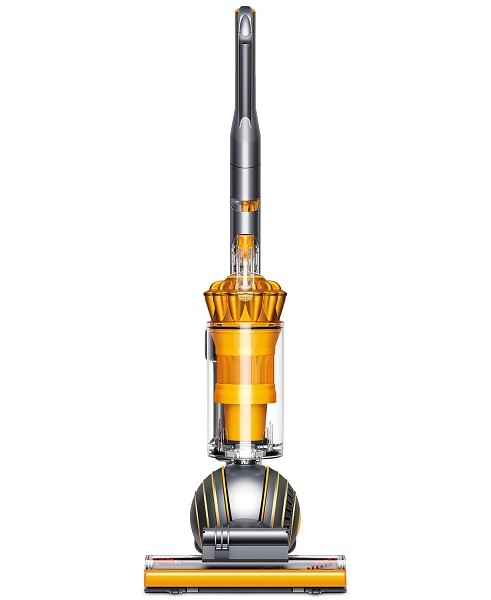 The Dyson Ball upright vacuum is a great choice for cleaning any floor surface. It’s easy to trek up and down stairs and makes a statement with its bold yellow exterior. 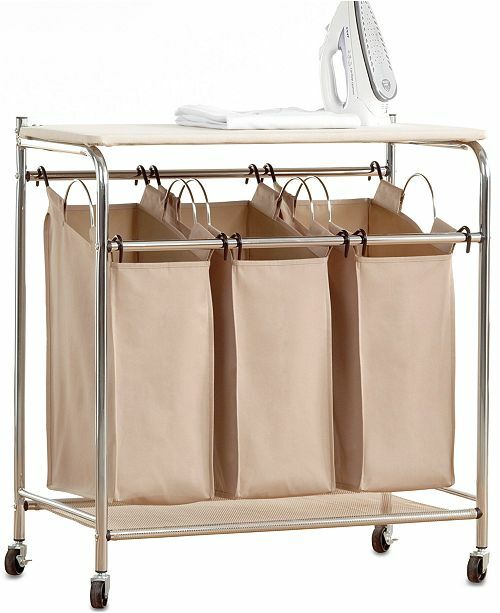 This sorting hamper/ironing board combo made my organizational heart do a little happy dance. It’s efficient, compact and will help keep you on top of all the laundry sure to come. Go green and make it simple! This trash/recycle unit makes recycling easier than ever. 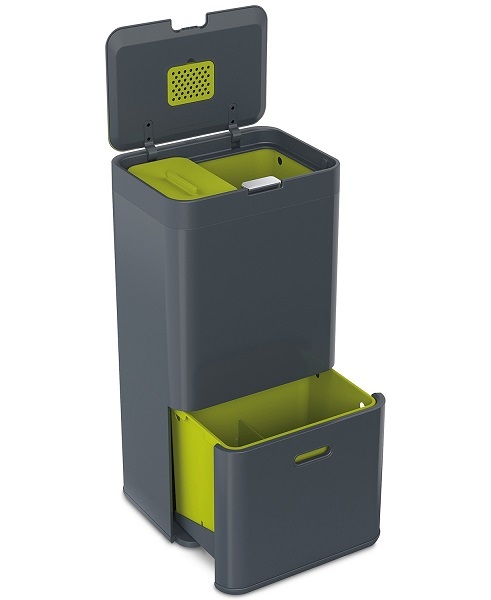 No extra bin or remembering to crush cans–it’s all right in one easy location! The best way to organize and save space in your cabinets is to unbox your pantry items. 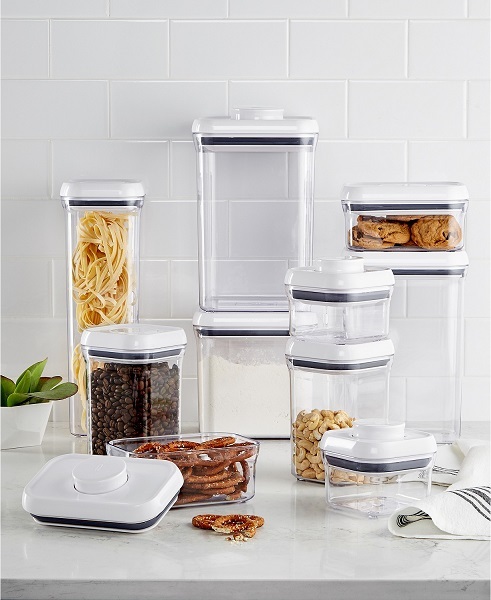 Put cereal, flour, pasta or snack foods in these Oxo Pop Containers and then stack them on top of each other for easy access. Don’t neglect a few fun pieces for your registry. Home decor items are ones your guest will love to buy and see displayed in your new place. 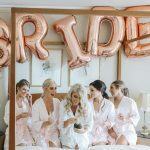 Those wedding photos you spent so much of your budget on deserve to shine! 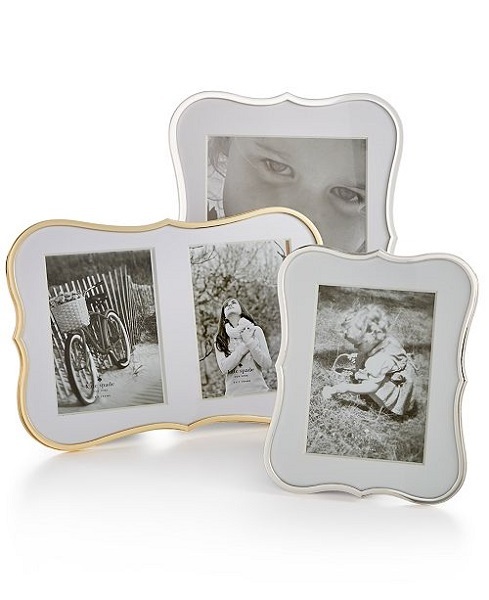 They’ll look beautiful in one of these Kate Spade Crown Point frames. 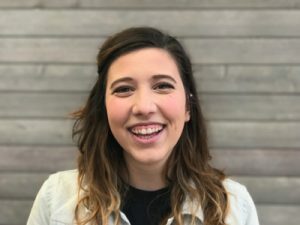 My personal favorite: the side-by-side gold one where you can display your wedding invitation on one side and a bridal portrait on the other. Macy’s offers a wide selection of furniture and decor pieces, from bedroom sets to dining tables. 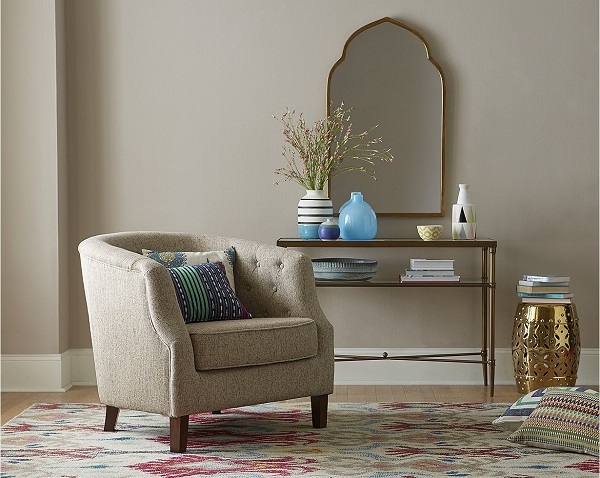 Add a reading nook to your living room with this fabric accent chair. Toss a few brightly colored throw pillows on it and bookshelf right next to it and you’re in for a wonderful escape! 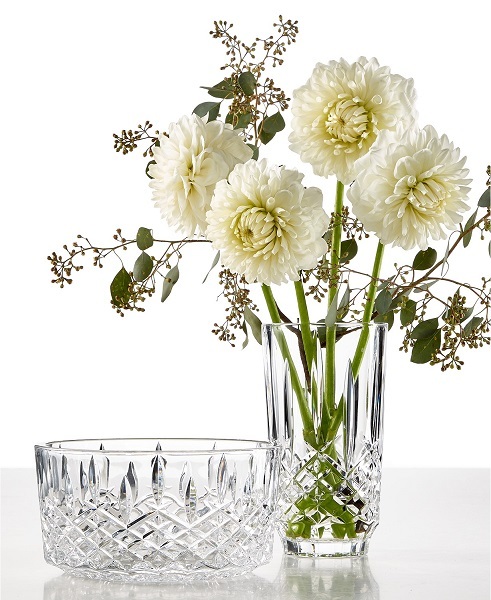 Waterford is the classic wedding gift and there’s no question as to why. This fruit bowl and vase are just two of the beautiful selections available at Macy’s. If you and your fiance love wine, don’t think twice about registering for a sturdy and luxurious wine rack like this one by Easton. 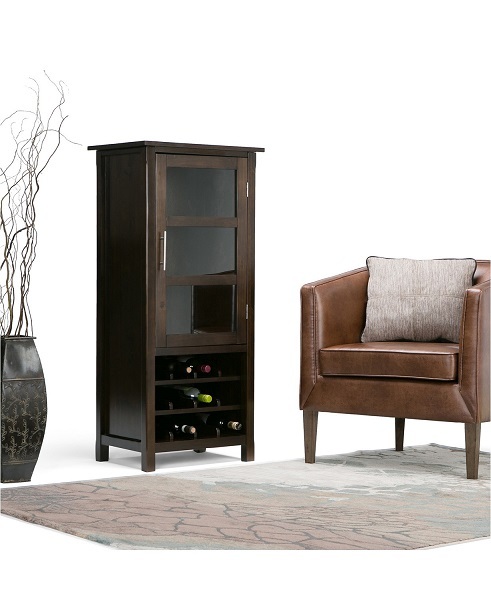 It will look nice in any space (maybe next to your new accent chair) and can hold all your red and white wine favorites. 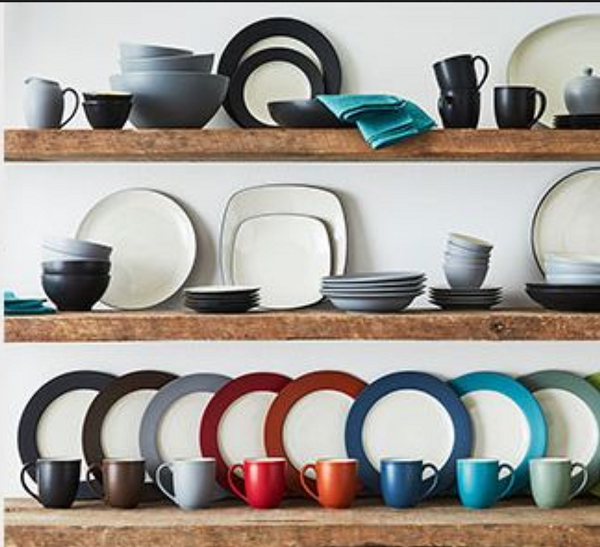 If you haven’t started your Macy’s registry yet, it’s really easy to get started. Create your registry by following a few prompts on the registry homepage. Looking a few more pieces to add to your already established registry? You can check out some more ideas on our GiveIt Blog. As always, point your guests toward all your registries in one location at RegistryFinder.com. -Written by Sami Moss, who would go back in time and register for the hamper/ironing board combo. So Many Ways to Win at Macy’s! 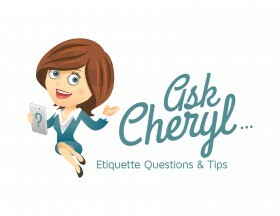 Ask Cheryl: Should Guests be Invited to Multiple Bridal Showers?